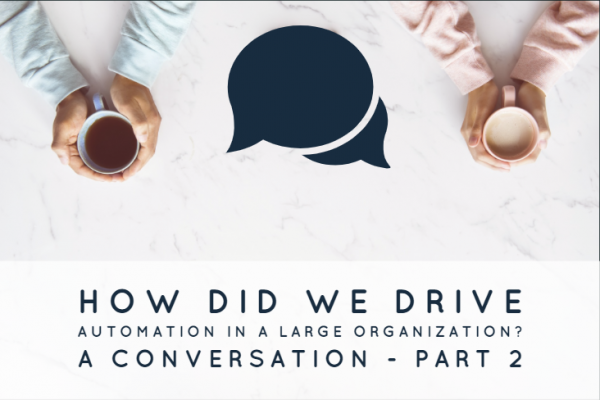 In this article we continue the conversation between Rob, Senior Manager – IT Automation, Sara, Senior Director of Business Automation and Digital Transformation and Jake who is a Product VP from the robotic process automation vendor IGS. Click here for Part 1. Recap: – Jake gives a great introduction on the shape of the RPA market. Sara: So before I get into how we evaluated processes to automate, I wanted to give you a very quick background on ACME, and our journey into robotic process automation. So in the last decade, our company has gone through multiple mergers and acquisitions and divestitures. So there was a lot of lift and shift in our technology stack and across the stack. With that came not just the technical debt, but also the operational debt. When we needed to think about a process redesign, we needed to think about our need for automation. So we developed the questions we need to pose to be able to assess processes from different business units. While we started off as a journey on focusing more on the bottom line, now we are shifting and pivoting towards how we can drive revenue. Our focus in the fiscal year 2020 is concentrated more on our top line growth. So then going back to the question of what what can be automated. We came up with three critical criteria. The things that we just we decided are important are: First, suitability, I would put another name to that is dependency. Second, external factors that drive the process in question, and third, the complexity. So let’s dig deeper into each one of these. So we’ll look into the suitability. 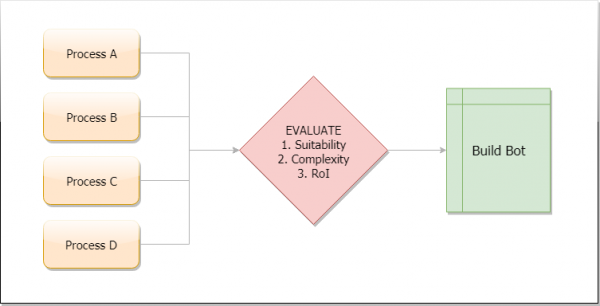 How do you evaluate if the process whether it’s suitable or a good candidate for RPA? So we said, okay, what are the different external factors that this process is dependent on? How many times the process itself changes? I wanted to note that the foundation or the guiding principle at the at the base of this entire process was we will not automate any bad process. That was a big deal for us, as we could if we wanted, challenge the process itself and then also have things like how many times is going to change? How rigid it is? Would it harm any system that is dependent on it? Also the question was this automation going to replace any systems or just as a stopgap? Well, we’re looking at robotic process automation only when it involves replacing or bringing in another system. So there are a lot of questions around that. But that was one of the factors that we looked into. Then moving on to the next criteria for of quantifying the process. Complexity. How complex it is, How many screens? How many systems that interacts with it? How the data flows between different systems upstream and downstream? We didn’t want to set ourselves up for failure by biting on something we couldn’t chew. And then the last, but the most critical criteria for us was; whether whatever we’re trying to automate is bringing value. Whether it’s saving costs, or it’s helping drive revenue, the ROI was very critical for us. So we asked at the onset to take whichever business unit came into our intake team, we made sure that there is a solid ROI behind the request. To hopefully alleviate some of the pains that we went through, I would recommend going through going slow and medium priority areas of positive versus high priority. Taking things that are not very complicated, but where we can able to show the value quickly. Start slow, going through the medium priority which gives you the most value. Jake: I just wanted to make a very quick point. What you just mentioned is critical. In a study of about 1600 very large enterprises, what we found is that usually the pilot program, or the first steps that you take in robotic process automation, is important to take them slowly. By slowly we mean understand RPA, and choose your processes carefully. But we noticed that as soon as enterprises get past that process, the scaling and the transformation stages are are much faster. So the time that you’re investing up front and choosing your process, really helps in going fast. So a good 90 to 95% of enterprises in the survey immediately go into scaling mode after the first two to three months if they have taken the first steps slowly. This is fascinating. Because it’s not just the number of bots that are deployed, or, and how long it took the value delivered. Rob: But very important to set the right foundation, the right infrastructure in place. I think the two key things is around the architecture, having the right architecture in place, and having the right Center of Excellence, right governance model that really drives all of this. If there’s anything that you can take away is; setting up the right governance and the right roles and responsibilities is key. The business owners are the owners of your processes that will come in to the filter or intake team. They are the ones who will take on the processes using the criteria that I mentioned earlier, they will categorize the processes and find whether the processes have been designed correctly, or if it needs to be revisited to make sure the process is refined and streamlined. Once they have vetted it, then IT takes the process and does the design and execution of the operations. This is a nice and tightly coupled way of operation. But it took us time to get there. So there was a lot of confusion between roles and responsibilities between business versus the biz ops team versus it. But in the end, I think we all came together. But I think if there’s one key takeaway is have your governance model roles and responsibilities defined, as soon as you are past your proof of concept phase as this is going to go a long way. Jake: So summarizing; driving automation in a large organization needs to be done in small steps in the trial phase as it tends to scale really quickly. After getting a team dedicated to robotic process automation, and choosing your platform, the next thing is to define a governance model, bot development roadmap and setup ways to evaluate processes for automation suitability.